Wanting to learn more about Ancient Aztec games? Or maybe you want to play them yourself? Many of the games of the Aztec empire were popular long before the Mixtecs reached their new homeland, and many are still played today. As with any culture, the Aztecs had many many games and sports. There were games for children, adults, nobles, and commoners. Being a deeply religious people, their games would often have a religious significance. Sometimes they would be based on the people's religious beliefs, other times the game would actually be a part of their religious ritual. The perfect example of this was the sport that became almost central to the Aztec culture - ullamaliztli. Ullamaliztli, the famous Aztec ball game, was played on a tlachtli ball court (the game is sometimes referred to as Tlachtli). The ball court was one of the first things built when the Aztecs settled a new area, making it the most important of the ancient Aztec games. It was a very difficult game played with a large rubber ball (the name of the game comes from the word ulli, or rubber). The game was not just important for entertainment, but also politics and religion. Learn all about the Aztec ball game here! Let's face it - the Aztecs were passionate about one of the most common ancient Aztec games - patolli. Patolli is actually a type of board game, which was played by the common people as well as the nobles. The name comes from the word for small red beans, which were used to play the game. Like the Mesoamerican ball game, patolli was played long before the Aztecs came along. Our understanding of how patolli fit with religion and ritual is limited. 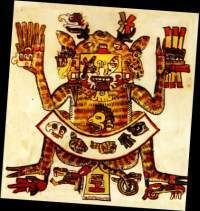 We do know that the god of patolli (and other games) was Macuilxochitl (five flowers), also called Xochipilli. 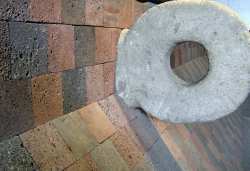 There are aspects of the game that can be compared to the Aztec view of the universe, such as the importance of the numbers 4 and 52 (52 years in the Aztec religious cycle). Sacrifices were made to the "dice" in hopes that the gods would bring victory. Patolli was very common, and it was normal to see players walking the streets with their patolli mats ready for another challenge. As with Ullamaliztli, betting was common. But in patolli, betting was central to the game. It was a game of chance and skill, played on a board shaped like a cross. Players would bet precious metals and stones, plants, or even themselves on the outcome of the game. In the play itself, players would move their pieces on and off the board based on the throws of the beans or stones (dimpled like dice). 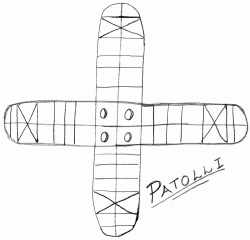 You can play yourself with this software version of patolli. Read more about the ancient game of patolli and those who play it today. Many other games and sports were common in the Aztec empire. Anything that tested skill and endurance was popular. Children played with bows and arrows, marbles and stones. For the adults, dances and ritual battles were often considered a form of entertainment. Music was, of course, very popular. Totoloque was another gambling game popular in Mexico at the time. The object of the game was to hit a target with gold pellets. Bernal Diaz, the Spanish historian, wrote that Cortés and Moctezuma II played totoloque together. Read more about ancient Aztec games here.